This Item Includes: • Hard Plastic Holder • 1 Year Warranty Canon Close-up lenses are for quick and easy close-up photography. 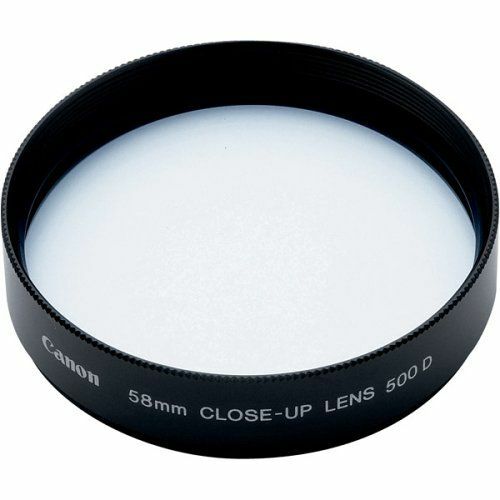 The close-up lens is screwed on to the front of a lens like a filter. Close-up lenses 250D and 500D have two achromatic elements to correct chromatic aberrations. They do not degrade the high optical performance of EF lenses. Close-up lens 500 has only one element, making it more affordable. The 250D is suited for lenses with a focal length anywhere from 30 to 135mm. The 500D and 500 are geared for lenses with a focal length anywhere from 70 to 300mm.